I have made so many delectable treats the last ten years from this little cookbook, packed with over fifty recipes for homemade truffles, caramels, toffee, fudge, brittles, chocolates, and nuts. When I saw another copy at a library book sale, I grabbed it immediately knowing it would find a good home on my cookbook giveaway Monday! I adore truffles and love giving them away for Christmas or hostess gifts. You will find recipes for truffles like Black Forest, Port, White Chocolate Citrus, Cinnamon, Ginger, and Tangerine. There’s so much more in this little book. You will love having it for the holiday season! Homemade candy is always a welcome and special gift. 1) Leave a comment below and tell me your favorite candy. 3) Winner is randomly chosen using random.org and will be notified by email and posted on the next Monday blog. Congratulations to last week’s winner of the Martha Stewart Baking Handbook, Pamela Shank! My favorite candy is Snickers!! My favorite — Reeses Peanut Butter Cups! YUM!!! my favorite candy is divinity! 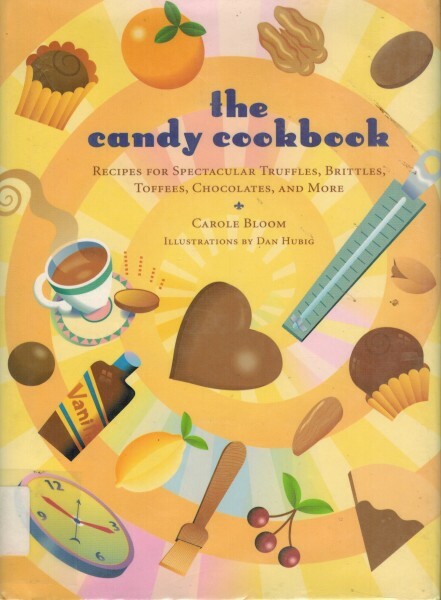 plus i’m always looking for candy cookbooks. they are hard to find! My favorites are Kit Kat and Twix!! Chocolate Peanut Butter Buckeyes! My Aunt Emily used to make them every Christmas. I loved them as a kid and they are still my favorite today. My favorite candy is honeycomb. I am born on Halloween so Candy is in my blood line! LOL. I love the old fashion Goldenrod’s peanut chews. I love anything with chocolate and almonds or peanuts; M&M’s, truffles, Hershey’s Kisses, Almond Joy…. should I stop. I have cooked and baked just about everything but never tried candy! Would love to win.